The Oakland Athletics are sitting bottom of the AL but are coming off back-to-back wins against the Cleveland Indians. The Baltimore Orioles their last four games agains the Detroit Tigers and are just one game back of the Minnesota Twins for the last Wild Card spot in the AL. Tyler Wilson (1-1, 2.12 ERA) will take the hill for the Orioles making his first start since June 16. 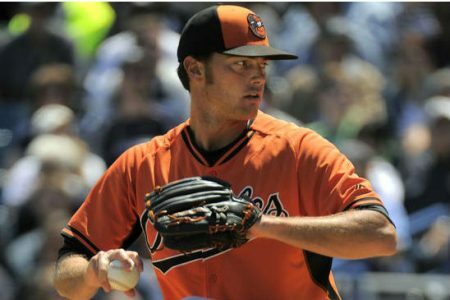 Chris Tillman injured his left ankle in a 2-0 win over Atlanta on Wednesday which has opened a spot in the rotation for the 25 year old rookie who is 1-0 with a 2.70 ERA away from home for the year and 1-0 with a 2.35 ERA under the lights. This will be his first start against the A’s and he’ll be backed up by a bullpen that has a terrific 2.81 ERA for the year. The Orioles are batting .241 away from home and .249 in night games. Manny Machado, who went hitless in four at-bats on Sunday after going 8-for-21 over previous five games, is leading the team with a .293 AVG. Jesse Chavez (5-10, 3.53) will take the mound for the Athletics. He’s 2-4 with a 5.75 ERA in his last seven starts but tossed six scoreless innings in his most recent game in Oakland where he’s 3-4 with a 2.33 ERA on the season. He’s 3-4 with a 3.38 ERA in night games and has a 6.75 ERA in four career relief appearances against Baltimore. He might not be able to count on much back-up from a bullpen that ranks among the worst in the major leagues with a 4.21 ERA. The A’s are batting .256 at home and .257 in night games. Billy Burns is leading the team with a .298 AVG and might be joined by Coco Crisp who is batting .438 with three homers in his last nine games versus Baltimore but has been out since May 19 with a injured neck. In what should be a close game we think a play on the Baltimore Orioles is where the value is in this match-up. Wilson should be able to hold his own and then the Orioles superior bullpen will make the difference.